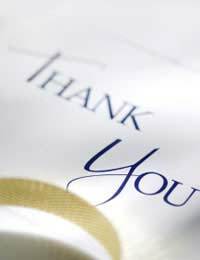 Many parents choose to write a letter of thanks to a school upon their child’s leaving. Often this is when the child graduates to the next level of education, though it may also be if a family is moving and leaving the school for good. This type of letter may be informal, but should always strike a respectful tone. When thanking a school it is polite to offer compliments about the education it provided your child. If you are unable to truthfully speak well of the academics, then find another facet of education you can compliment. The wonderful facilities, dedicated staff, interesting extracurricular programme, wonderful course selection, entertaining school tours, winning sports teams or fun drama productions are all viable options for a thank you letter to a school. It may be that you do not feel you can honestly compliment the school, in which case it is better to forgo writing a letter rather than sending one which attempts to veil criticisms under a message of thanks. When thanking a school for all that it offered your child you can be less than formal, though if you choose a formal format that is fine too. Be sure to address the letter to an appropriate recipient such as the headmaster, and include the name, title and mailing address. Date your letter and use a respectful salutation and closing. If you would address the recipient by his or her first name in a conversation then you may choose to do so in your letter. Hand delivery of such a letter is fine, as is postal delivery or email delivery if electronic mail is a standard method of communication from the school. Now that Joan is leaving [School Name] and our family’s relationship to the school is coming to an end we wanted to write to thank you all for everything you have done for our children. We have had pupils attending [School Name] since our oldest son, George, began in [Year]. George loved his classmates and belonging to the [School Name] rugby squad, and once his younger brother Michael attended a match we knew we would be sending another child to [School Name]! Both boys excelled academically, but also made friends with whom they remain close to this day. We couldn’t have wished for any better experience for our boys. Joan, our only daughter, began at [School Name] in [Year]. Though Joan had no interest in sports, she was immediately drawn to the drama programme and went on to participate in a dramatic production and musical theatre production each year of her enrollment. She found a mentor in [Teacher Name] and with her help has been accepted at [Institute of Higher Education] to study dramatic arts. We have always felt more than satisfied with the education our children received at [School Name], but more than that we will remain ever thankful for extracurricular activities which helped our children become well-rounded young adults. We will always think of [School Name] fondly for that.